Home / Opinion / Pres. 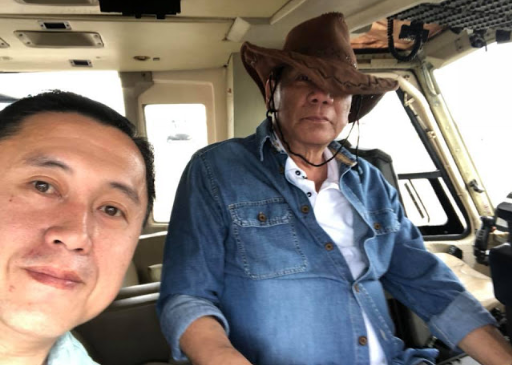 Duterte to Helicopter Pilot on Benguet visit: "Sino ba ang Presidente? Susunod ka ba O Susunod?" Pres. 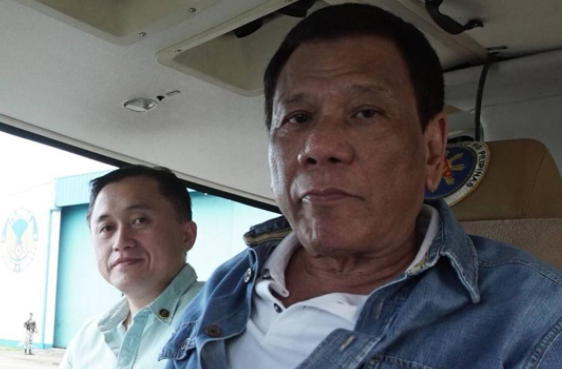 Duterte to Helicopter Pilot on Benguet visit: "Sino ba ang Presidente? Susunod ka ba O Susunod?" Concerned netizen and President Duterte supporter, recently took to social media to share a very striking post regarding a news about the courage and bravery of President Rodrigo Duterte that according to him was not reported and carried by mainstream media. The netizen, Viczter Cruz expressed his dismay to the alleged manipulation of mainstream media and shared a part of RADIO Pilipinas' interview with Special Assistant to the President (SAP) Bong Go. 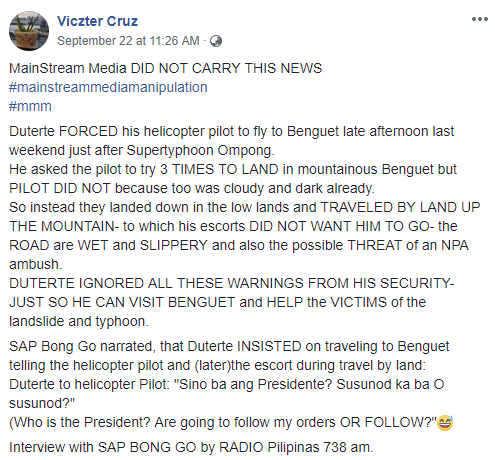 According to Cruz' post, the President as a matter of fact, compelled his helicopter pilot to travel to Benguet a weekend ago soon after Super typhoon Ompong. "Duterte FORCED his helicopter pilot to fly to Benguet late afternoon last weekend just after Supertyphoon Ompong. ", he wrote. He likewise pronounced that President Duterte even requested three times to land in Benguet, yet the pilot did not allow it. "He asked the pilot to try 3 TIMES TO LAND in mountainous Benguet but PILOT DID NOT because to was cloudy and dark already. ", the netizen said. landed down in the low lands, traveled by land up to the mountain, with wet and slippery road and conceivable threat of an NPA trap. But as per the netizen, President Duterte disregarded all these threats just so he can help and visit the victims of the landslide and storm. "DUTERTE IGNORED ALL THESE WARNINGS FROM HIS SECURITY- JUST SO HE CAN VISIT BENGUET and HELP the VICTIMS of the landslide and typhoon. ", he uttered. Cruz further revealed SAP Bong Go's story, telling that the President even reprimanded his pilot and escorts to just follow his orders, leaving them no choice. "Duterte to helicopter Pilot: "Sino ba ang Presidente? Susunod ka ba O susunod? ", he wrote. 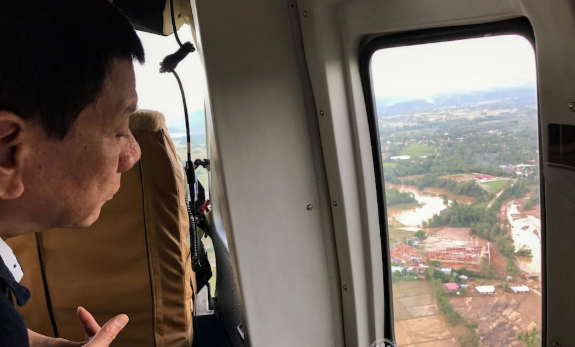 Duterte FORCED his helicopter pilot to fly to Benguet late afternoon last weekend just after Supertyphoon Ompong. He asked the pilot to try 3 TIMES TO LAND in mountainous Benguet but PILOT DID NOT because to was cloudy and dark already. So instead they landed down in the low lands and TRAVELED BY LAND UP THE MOUNTAIN- to which his escorts DID NOT WANT HIM TO GO- the ROAD are WET and SLIPPERY and also the possible THREAT of an NPA ambush. DUTERTE IGNORED ALL THESE WARNINGS FROM HIS SECURITY- JUST SO HE CAN VISIT BENGUET and HELP the VICTIMS of the landslide and typhoon. Duterte to helicopter Pilot: "Sino ba ang Presidente? Susunod ka ba O susunod?" (Who is the President? Are going to follow my orders OR FOLLOW?" Interview with SPA BONG GO by RADIO Pilipinas 738 am."